If you’ve looked in Task Manager and wondered what on earth the jusched.exe process is and if you can turn it off, then you are in luck. 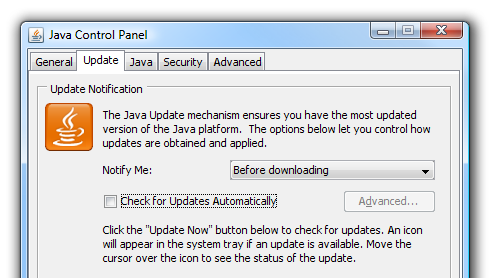 This process is the Java Update scheduler, which is a process that wastes memory all the time just to check once a month whether there are new updates to Java. There’s a scheduled tasks feature built into Windows for this type of thing… the java update scheduler is obviously not being used for critical updates since it’s only scheduled to check once each month. Since I simply can’t understand why the process needs to waste my memory, it has to go. 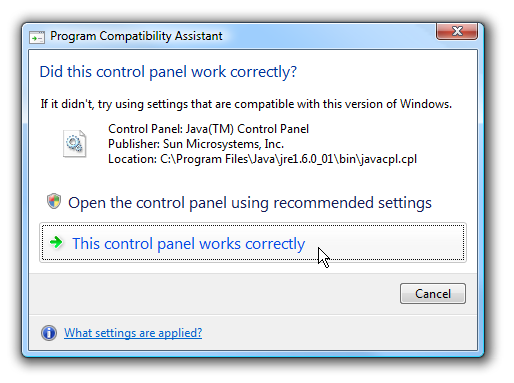 What you’ll need to do is open up Control Panel, and then if you are in XP you can click on the Java icon, or in Vista you can click on Additional Options, and then click on Java. Does anybody else think that the sentence should read “the fastest and most secure Java” instead of the way it’s worded? After you click the Never Check button above, you’ll probably receive this error message if you are in Windows Vista, stating that it also hasn’t been properly certified to work with Vista in the first place. Just click that it works correctly. That does make me wonder… I guess we’ll miss the update that fixes the problem with the control panel… or will we? What you can do instead is schedule a task to run monthly using the built-in Task scheduler. 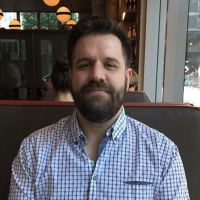 If you don’t care about updates to Java, then disregard the next part. 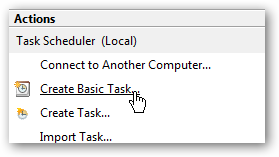 Just type in Task Scheduler into the start menu search box to open the task scheduler, and then click on Create Basic Task. Follow the wizard along to pick a month and date, and then when you get to the “Start a Program” screen, use this as the path, adjusting if you are running a different version of Java. The key thing is that you run the jucheck.exe in your Java directory. 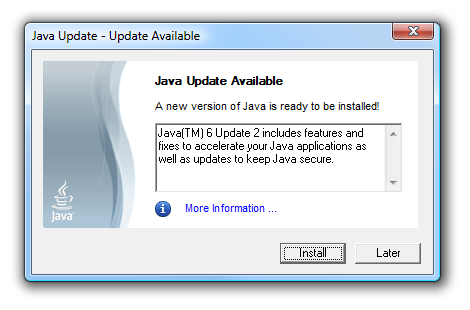 Now when the scheduled task runs once a month, or whenever you schedule it, you’ll get this dialog if there is a new version, or another dialog stating there are no updates to Java.